Στα παρακάτω Εκπαιδευτικά Προγράμματα Erasmus συμμετέχει το Τμήμα Επιστήμης Φυσικής Αγωγής και Αθλητισμού του ΔΠΘ, και επιστημονικά υπεύθυνοι των προγραμμάτων είναι Καθηγητές του ΤΕΦΑΑ ΔΠΘ που διδάσκουν στο ΛΕΙΔΙΑΤΑ. Επίσης πολλοί φοιτητές και απόφοιτοι του ΛΕΙΔΙΑΤΑΑ συμμετέχουν ενεργά ! PReventive Outreach Through Exercise and Counseling Techniques in Soccer (PROTECTS) is an innovative project that will be jointly developed by academics, clinical experts and athletic/soccer trainers and players coming from different countries of Europe in order to PROTECT athletes, especially the youngest, from health and safety hazards in the “soccer field”. 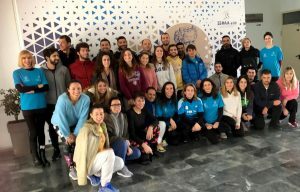 Its main goal will be to identify the gaps in the strategies used for the prevention of musculoskeletal injuries in soccer and in the counselling and communication skills that are needed in order to motivate the coaches and players in a safer participation to soccer and sports, and to propose certain strategies for physical (e.g. 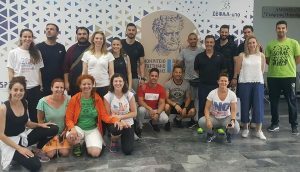 specific exercise drills) and mental preparation in order to contribute at the reduction of preventable musculoskeletal diseases during training and games.  The HEALTHY project is based on the transdisciplinary approach and its aim is to design and to apply a program for pupils that will give them the opportunity to adopt a healthy lifestyle, starting from their schools, through physical education activities, while it will familiarize them with the European and ancient Greek culture through their participation in Greek ancient games and traditional European exercise games. The creation of this project was motivated by the fact that a considerable proportion of children in many European countries do not meet recommended levels of physical activity and they are engaged in sedentary behavior. The GO Functional Improvement & Tourism (GO FIT) project addresses the gap in learning programs between HEI’s exercise and health experts with both educational and clinical expertise, in collaboration with tourism specialists. So, the GO FIT project is designed to develop a new learning program, a web platform and a multimedia application with transdisciplinary approach for exercise, health and tourism experts, to achieve relevant and high quality skills and competences in designing the appropriate program for tourists and helping them to adopt a new healthy lifestyle. Musculoskeletal disorders (MSDs) such as neck/back pain or upper limb disorders remain the most common occupational disease in the European Union and workers in all sectors and occupations can be affected. They are also an increasing problem and one of the most important causes of long-term sickness absence. Beside the effects on workers themselves, MSDs may lead to high costs to enterprises and the society as a whole and is related with high socioeconomic consequences in terms of health expenses and loss of working days. While sitting, office workers tend to lean forward or to slouch in the chair. This partial immobilization can cause low back pain or neck pain because static posture increases stress on the back, neck, shoulders, arms and legs. In particular, sitting can add large amounts of pressure to the back muscles, spinal discs and ligaments (Beneka et al, 2014). Therefore, strength and conditioning professionals, athletic trainers, and physical therapists often come across on going or recurrent complaints of neck pain. While the etiology of musculoskeletal pain symptoms is multi-factorial, there is a general consensus about the beneficial effect of therapeutic exercise. 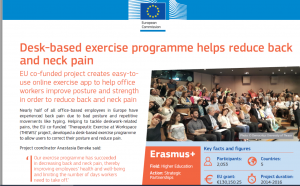 The partnership has come together because of the common purpose and belief that health promotion and well-being in the workplace is one of the most pressing problems facing European economies. The common goal and vision amongst the partnership members is that, there needs to be a learning program (focused on transforming ‘ideas into action’ in line with Europe 2020 recommendations) for exercise and health specialists, which will act as a catalyst for their own professional development and that will enhance well-being and quality of life in the Work Space.